Like many people the need to make a living and bring up children severely curtails the ablity to get on the hill. That difficulty is compounded by the caprice of the weather which often spoils the best laid plans. However just occasionally the stars do all line up and you get an unforgettable day. In our case a school trip to London for youngest son gave a very rare midweek break. 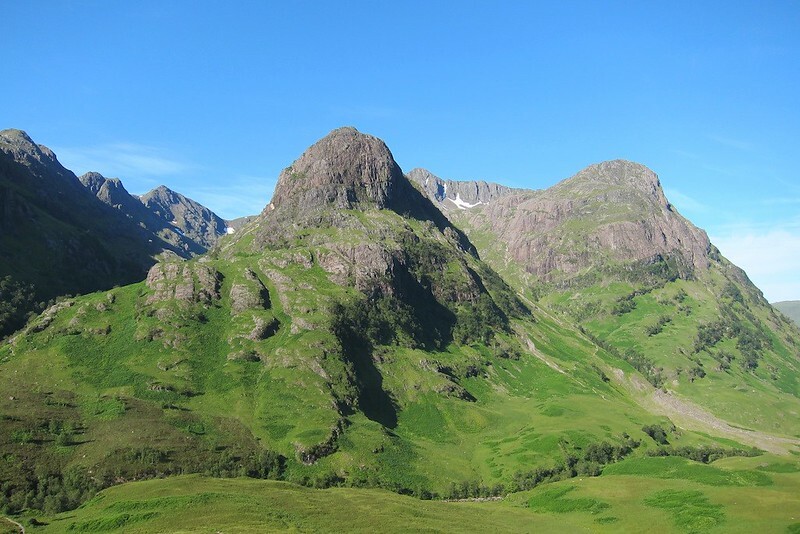 We dropped him off at school and headed rapidly in the other direction for Glencoe and a good forecast. 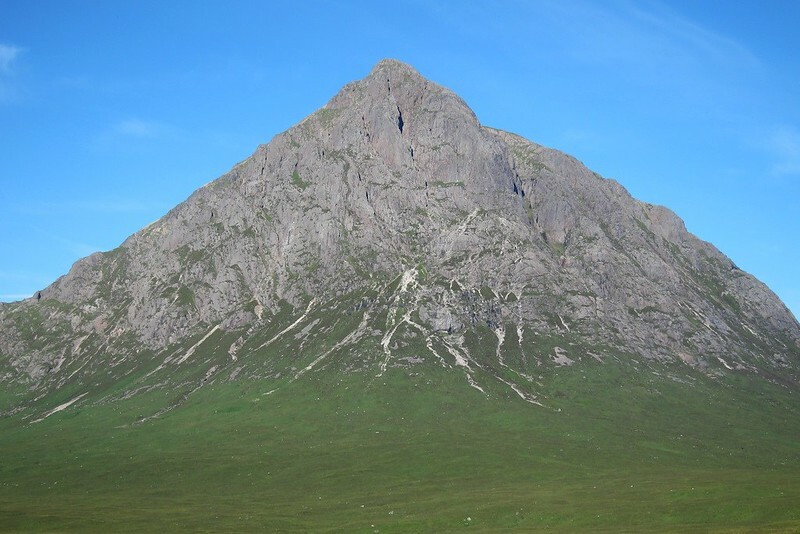 I had last done Buachaille Etive Mor 35 years ago in deep snow. Time to go back then and I badly wanted to do Curved Ridge. 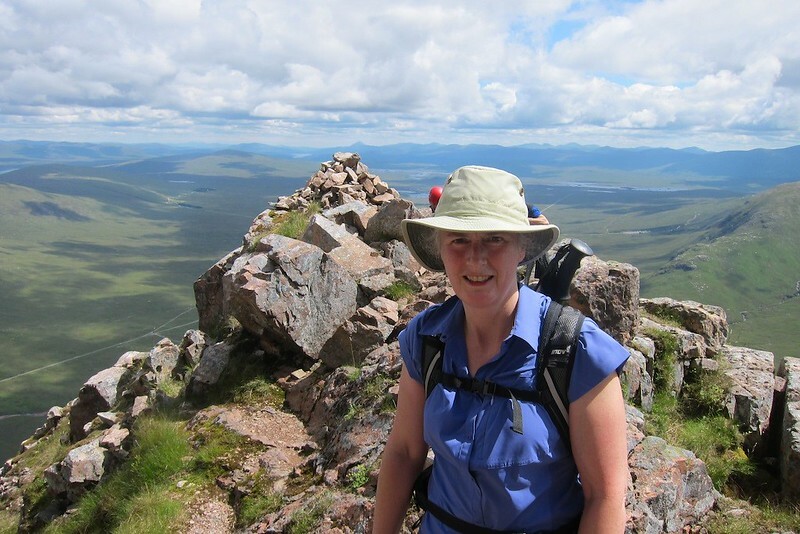 It also allowed Margaret to reduce the gap between us in munro totals. Four hours later we were parked at Altnafeadh. 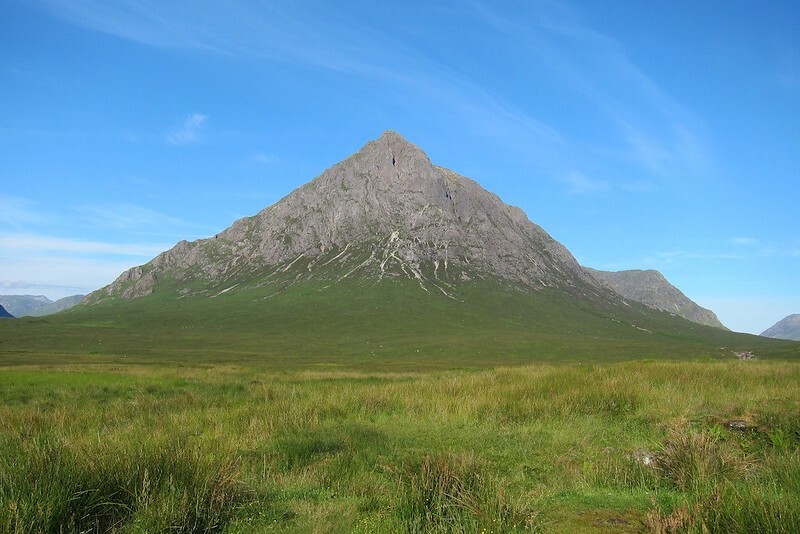 Not a great time to start on a hot day but the climber's path traverses the slope at an amenable angle until the scree when it gets a lot steeper. Hot work in the midday sun and the route is not obvious from close up. The whole atmosphere is Alpine and it feels quite intimidating. Stonefall is a not insignificant risk particularly when crossing Crowberry Gully. The route goes up right and then back left above steeper rock to cross the gully. I felt the photodiagram in Ralph Storer's book took you too far right as we tried that and didn't fancy crossing the gully there. We dropped down a bit and the way was much easier and well used. The challenge on this route is finding it. 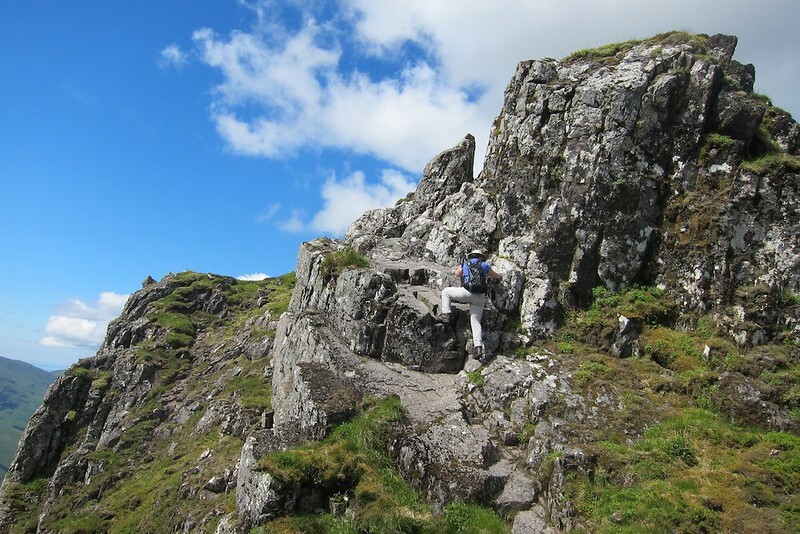 The scrambling is not difficult but it is very easy to get off route and onto dangerous ground. I would not like to do it in the wet either. BEM zoomed. The dark slot is part of Crowberry Gully and the clean rock to its left is Rannoch Wall. The route goes up the scree below all this then heads right until it is possible to move left back across the gully. Curved Ridge goes to the left of Rannoch Wall. BEM from Altnafeadh. the route is beyond the left side of the mountain. Looking up Great Gully from the approach path. Once across the gully and on Curved ridge proper it was steeper and harder but felt a lot easier. the rock was clean and full of big holds. 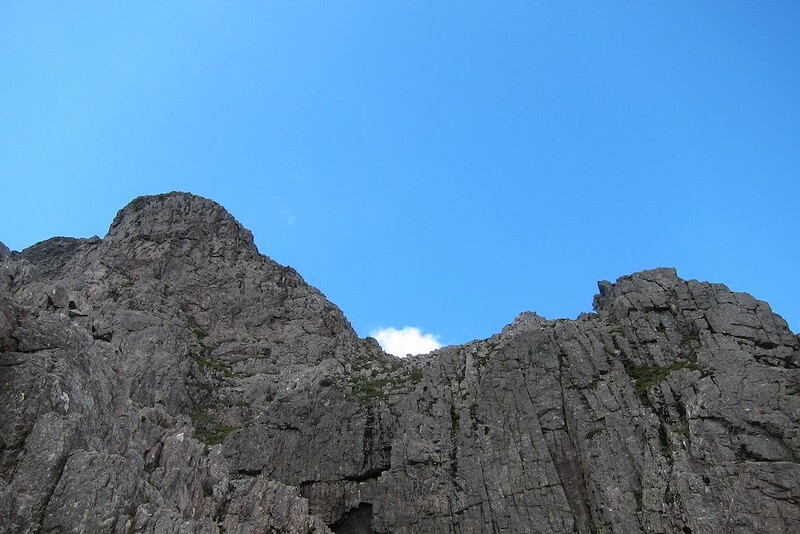 There seemed to be several variations but we just went straight up the middle of the buttress. 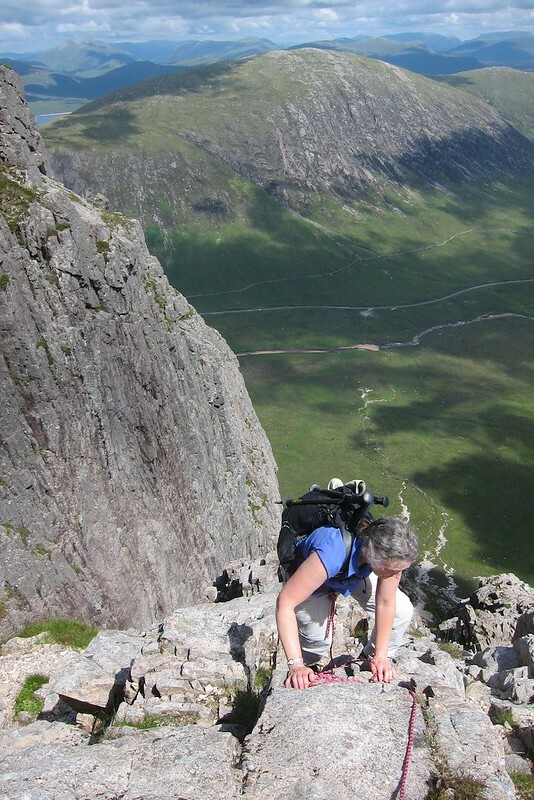 Margaret was glad of the psychological comfort of a rope on the steepest bit which was a corner crack. 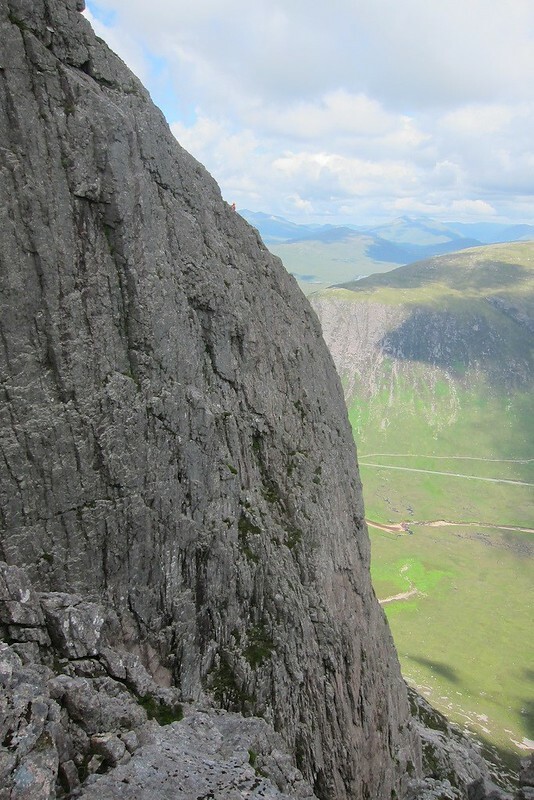 There were stunning views of climbers on Rannoch Wall but all too soon it was over. From the ridge top there was a rough path behind Crowberry Towerand in a short time we were atop Stob Dearg free of all verticalities. 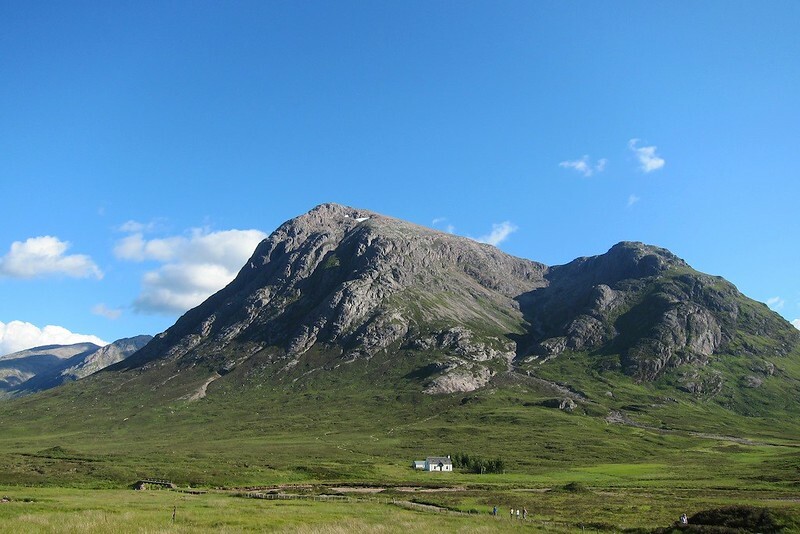 The left side of the big rock face is Rannoch Wall. Curved Ridge goes up the middle of the rocks on the left of the photo. Rannoch Wall from Curved Ridge. See climber on the skyline for scale. Easier ground above the steep bit. At the top of Curved Ridge. Equilibrium restored. From there it was a very enjoyable yomp over the rest of the stobs to the other end of the mountain then a quick descent of the lovely path down Coire Altruim and back to the car. 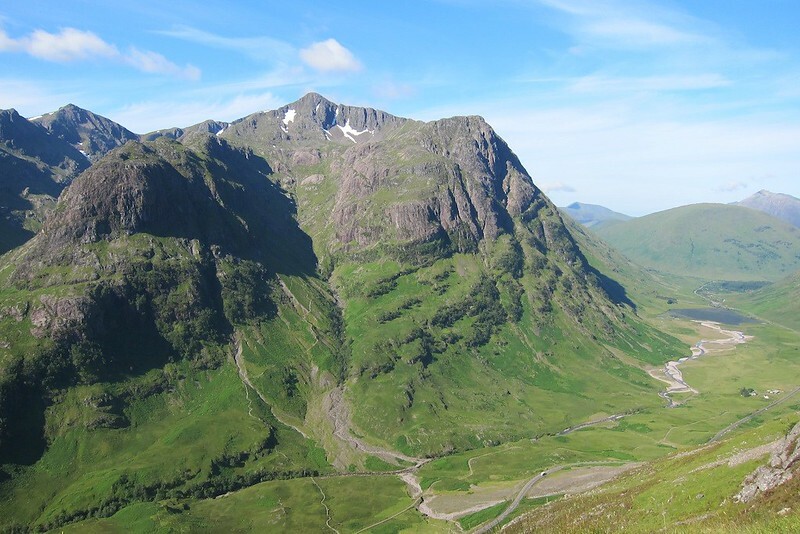 Looking down Glencoe from Stob Dearg. 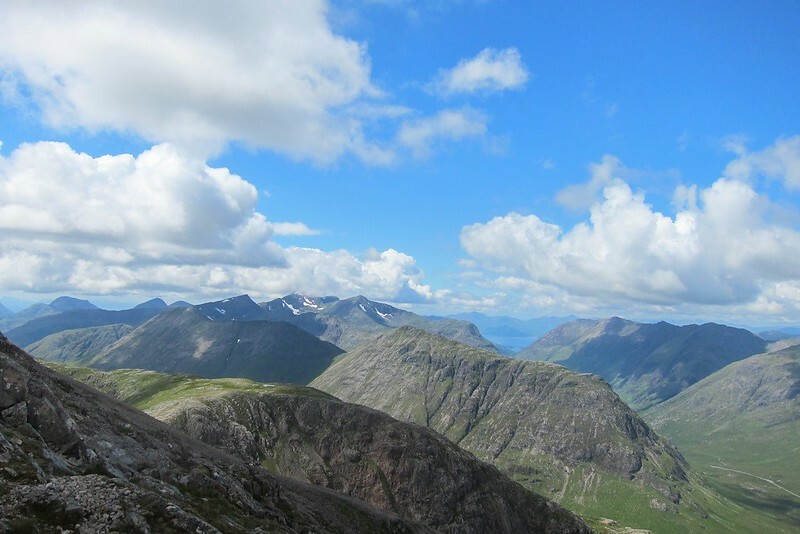 Looking north from Stob Coire Altruim. The second day was even more stunning. 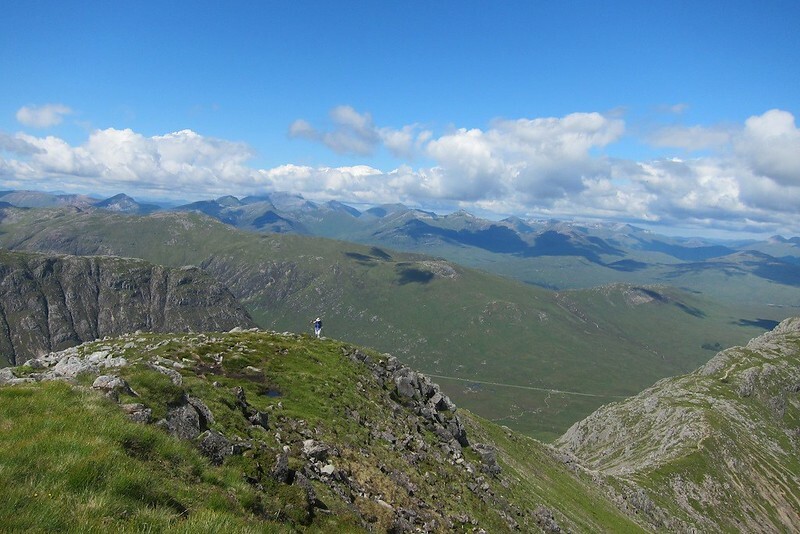 Even at 8.30 it was very hot but the path up Am Bodach was one of the finest I have ever been on. 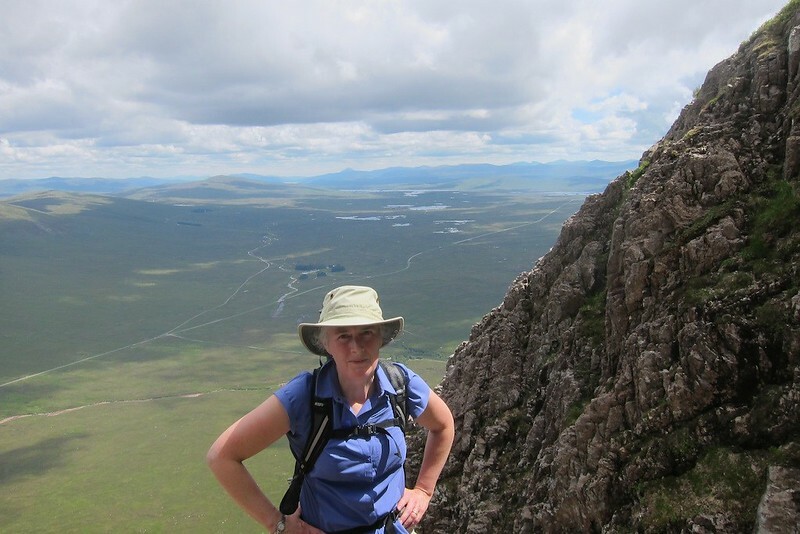 It winds its way up at an amenable angle through steep craggy ground and the views were world class. We were assuming it would be cooler on top but Am Bodach was windless and the sun burning hot. We hadn't taken enough water yesterday so we doubled up today and we drank it all. Looking into the Lost Valley. If the walk up was good the next couple of hours was total joy. As good a walk/scramble as we have ever had. The rock was bone dry and we had it almost to ourselves. The guidance was to stick to the crest and we followed it religiously. Even when the route seemed improbable it always went - and gloriously. The Crazy Pinnacles were particularly good but then it all was. 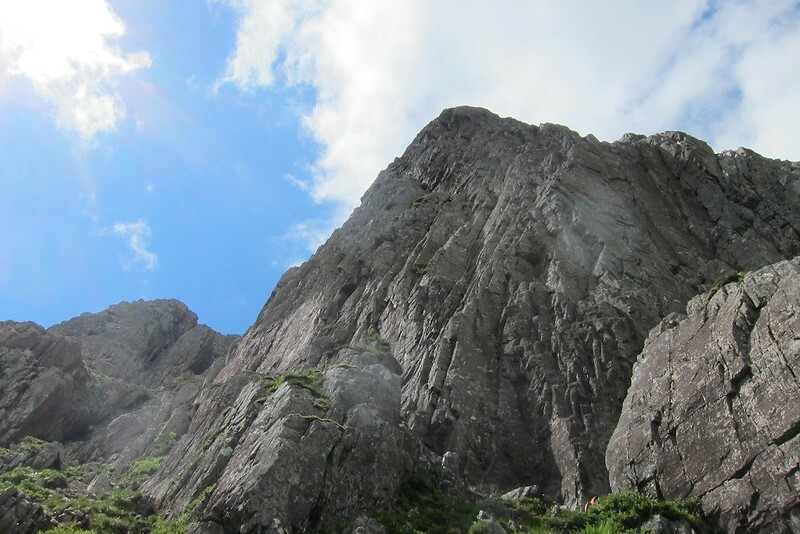 The scrambling was a similar standard to Curved Ridge but in these conditions it felt a whole lot easier. The only drawback was it was so hot. I was sweating so much that the suncream was running into my eyes; it was a small price to pay. All too soon it was over and we spent a good time on the summit of Sgorr nan Fiannaidh soaking in the views. 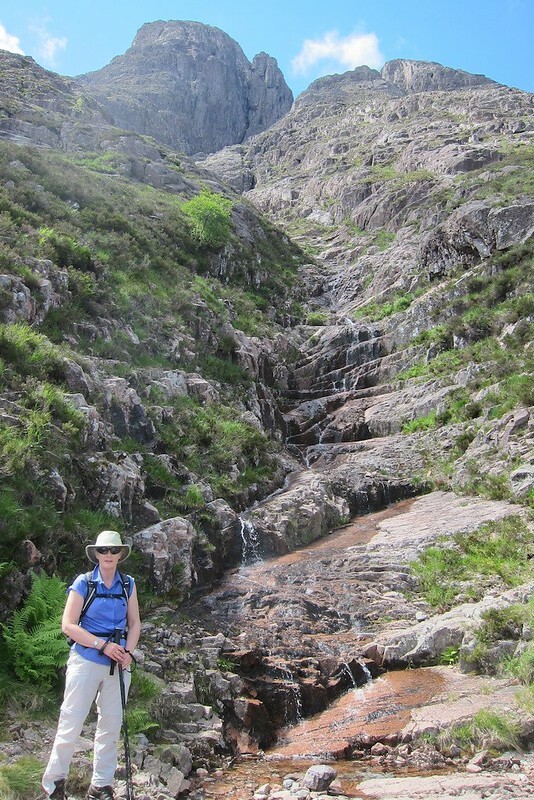 We didn't fancy the steep descent back into the glen so opted for the friendlier route back towards Glencoe village. At 5pm it was still 26 degrees in the shade and 38 degrees back in the car. Stunning set of photos, the photo of you with the Great Gully is wonderful. Some absolutely stunning photos there. Well done! Lightfoot2017 wrote: Some absolutely stunning photos there. Well done! Thanks for the comments. 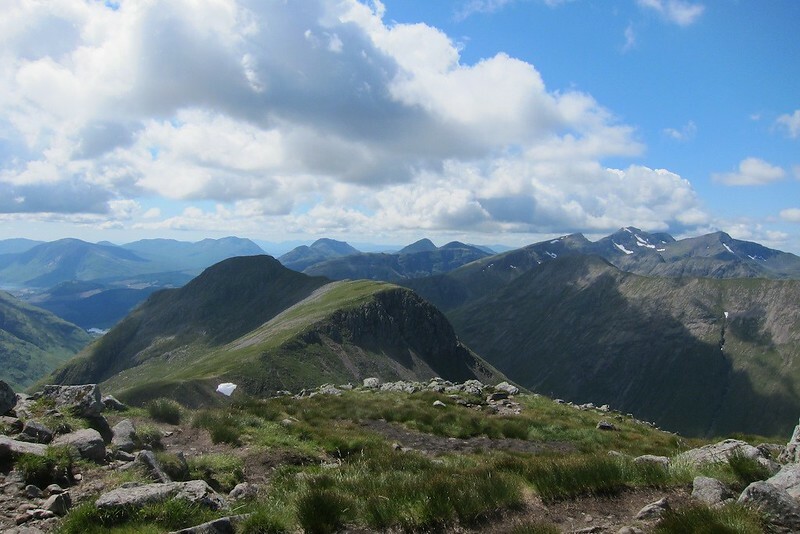 when I first did Stob Dearg it was in the clag so waited a long time to see the view. In fact the whole week was poor weather until about 3pm on the last afternoon when the clouds opened to reveal the entire highlands coated in radiant white. It was one of the most dramatic things I had seen but frustrating as we had to go home. Beautiful photos and a stunning trip - well done to you both. 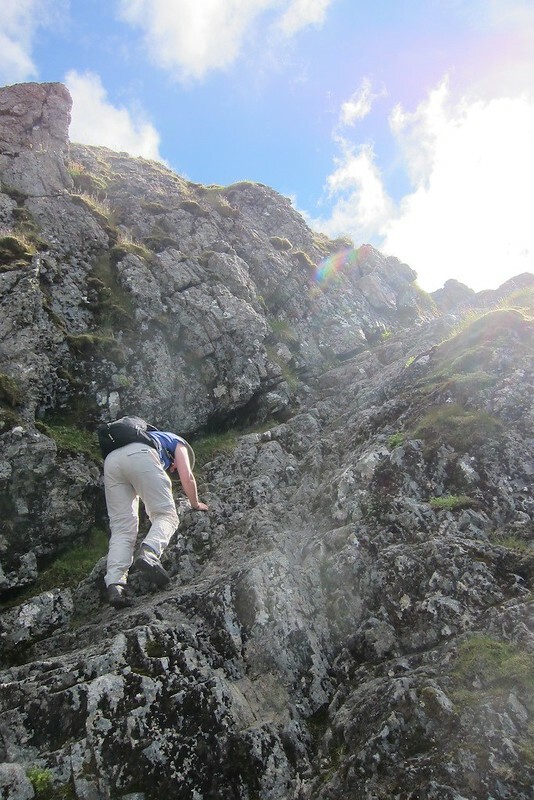 Still have to tackle the Anoach Eagach so thanks for the photos. Huff_n_Puff wrote: Beautiful photos and a stunning trip - well done to you both. 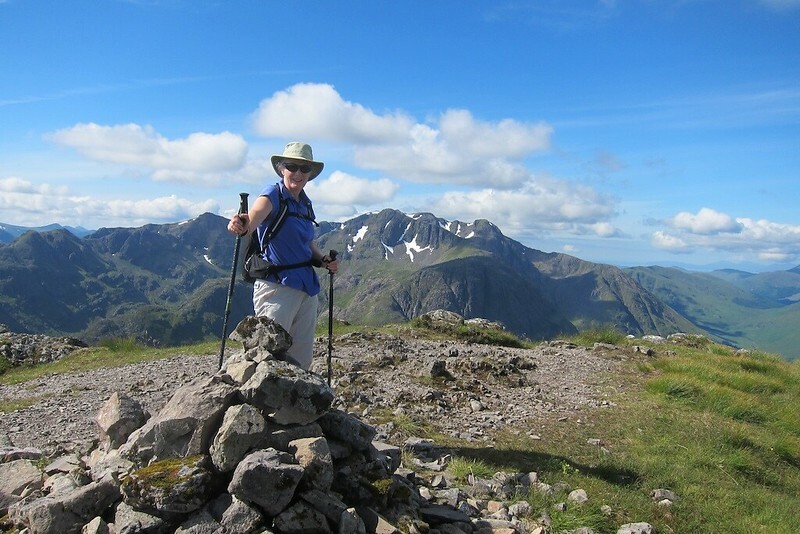 Still have to tackle the Anoach Eagach so thanks for the photos. Thanks. The big problem is that you can't take a dog on it unless it's a wee one that you can carry! Ours still hasn't quite forgiven us for leaving her at home. Wow, that was quite a couple of days out in the hills - weather-wise and achievement. Lovely photos and text. Really enjoyed reading this!